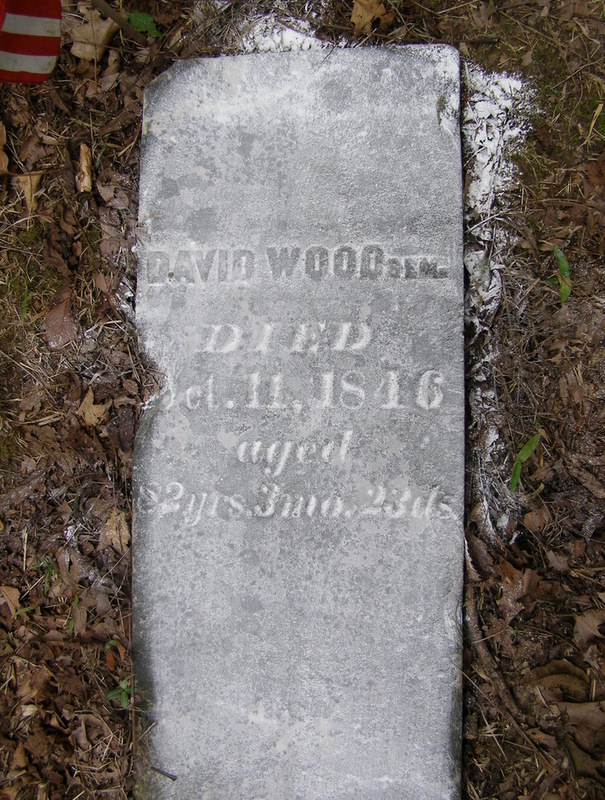 "David Wood [Sr.], the second of the brothers [sons of John Wood Sr.], died on the Smith survey, at the age of eighty-four years. His children were John S., who married Elizabeth Camerer, and moved to Indiana; George married Sarah Fee, and moved to the same State; Joseph married Margaret Bennett, and died in Washington in 1878; Absalom married Phoebe McGohan, and lived in Tate; Dr. David married Mary Day, and died at Point Isabel, where he follow his profession; Bazel G. died at Vicksburg, Miss., and Alfred in the (Washington) township. The daughters married, William Barkley, Robert Badgley, Joseph Dole, and James Buchannan." Information from Phyllis Gillaspie. Not confirmed as of Sept. 16, 1997. [S29] Clermont Co. Genealogical Society, History of Clermont Co, Page 281. [S31] Unknown author, Ohio, County Marriages, 1789-2013. [S25] 1860 Census, Moscow, Washington Townshio, Clermont Co. Ohio, Wife Mary had been married to, born children by and then been widowed by Lorenzo D. Page in the 1860 Census. Find A Grave Memorial# 16302147. [S29] Clermont Co. Genealogical Society, History of Clermont Co, Page 363. [S29] Clermont Co. Genealogical Society, History of Clermont Co, page 147. Mary Day was also known as Polly Day.11 She Frank Carl Wood wrote "Polly Day was the daughter of Francis Deborah Lambert, a British Army officer who came to the American Colonies with this army to suppress the American Revolution and thereafter remained. He was a younger brother of a Lord Lambert of England. [S490] Martin E. Day, 8 Feb 2005. [S29] Clermont Co. Genealogical Society, History of Clermont Co, Page 280-281, article on M.A. Wood. [S29] Clermont Co. Genealogical Society, History of Clermont Co.
[S45] Clermont County Genealogical Society, Mar Rec Clermont Co OH 1850-1874, Page 386. Find A Grave Memorial# 16302154. [S718] 27 Jun 1870 Federal Census, unknown repository address. [S45] Clermont County Genealogical Society, Mar Rec Clermont Co OH 1850-1874. The first settlement made in Southern Clermont, and the second permanent one in the county, was by the Wood family in Washington Township. This family is of pure English extraction, coming down from the Revolutionary era with an honorable record for services to the patriot cause in the days of 1776. David Wood, born and living in Virginia, was a soldier in "The Virginia Line on the Continental Establishment," and his son David Wood married a Miss Smith, descended from the early immigrants to that State from Germany, just before the old French and Indian war. About the year 1791, David and his brother John Wood immigrated to Kentucky and settled at Washington, then the leading town of the northern part of that State. In the fall of 1795 the two Wood brothers, David and John, accompanied by Elisha, Nathan, and Richard Manning (brothers), who had married respectively three sisters of the two brothers Wood, moved over from Kentucky into what is now Washington township and built what was called "Wood and Mannings' Station," at which time the only other building of any kind in what is now Clermont County was the log cabin of Col. Thomas Paxton, erected a few weeks before, back of the present town of Loveland. "Wood and Mannings' Station" was built with a stockade, and was partly a fort and partly a double cabin, being used as a dwelling and also for protection against predatory bands of Indians and wild beasts. At its old-fashioned hearth of heaped logs, with its cheerful fire, in the winter of 1795-96 sat many nights Daniel Boone, Simon Kenton, and Cornelius Washburn,-who had been Indian-fighters and hunters in Kentucky with the Woods and Mannings, and recounted their exploits and laid plans for future expeditions. Shortly afterwards the Buchanans, the Sargents, and other settlers came in. John Wood was one of the three first associate judges of the Common Pleas Court, appointed in 1803, and died while filling judicial office in 1807. 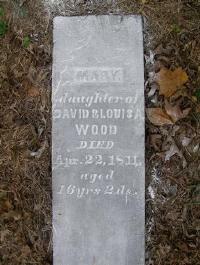 David •Wood died at a ripe old age about 1848, leaving a son, Dr. David Wood, who had married Mary Day, a daughter of Joseph Day and Deborah (Lambert) Day, married in 1819 and both still living. Mrs. Deborah Day was a daughter of the Mr. Lambert who lived at Williamsburgh at a very early period, and who was one of three English soldiers who settled in America. 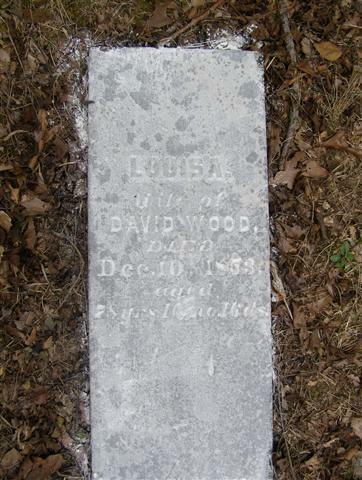 Dr. David Wood died in 1854, and his widow subsequently married L. D. Page, and by him had one child,-Amanda J. Page. The children of' Dr. David and Mary (Day) Wood were Hercelia, married to Thomas M. Padget; Almina, married to Thomas J. Ashley; Marcellus Augustus, the subject of this sketch, born May 14, 1846; George A; and Sarah C., married to Leonard B. Dixon. Marcellus A. •Wood was educated in the district and at the Felicity schools, and completed his studies at the Lebanon (Ohio) Normal School. He received a teacher's certificate at eighteen years of age, and immediately began teaching, following that calling -ten successive years in Washington, Franklin, and Pierce Townships, acquiring a merited reputation as one of the best educators in Clermont. He was a member all that time of the County Teachers' Institute, prominently connected with its annual sessions, and served on its executive committee and as its secretary for one year. Five years he served as assessor of Washington Township, and in 1874 was elected recorder of Clermont County, and in 1877 was re-elected by nearly a thousand majority, leading his ticket by several hundred votes. His second term will expire in January, 1881, and in six years of official duties his administration of this important office has been marked by an efficiency that stamps him as an able and trustworthy official. He was married Dec. 17, 1874, by Rev. H. M. Keck, to Miss Ada H. Richards, daughter of Robert J. and Bena (Smith) Richards, of Franklin Township. They have no children, and reside at Glen Este, in Union township, on the noted "Peticolas" fruit-farm of seventy-one acres, which Mr. Wood purchased in the spring of 1880 and to which he immediately removed. He belongs to no denomination, but his wife is a member of the Methodist Episcopal Church. In 1876 he joined Batavia Lodge, No. 136, of I. O. O. F., and has passed all its chairs. He is a Democrat in politics, and has taken the liveliest interest in all political campaigns. By being accidentally thrown from a spirited horse in August, 1867, his left leg was broken so as to require its amputation. Mr. Wood, as a man, neighbor, citizen, and public official, has the confidence and esteem of the community in an eminent degree, and it would be difficult to find in Clermont a, man who stands higher in the public estimation than he. at Clermont, Ohio, USA.4 He appeared on the census of 10 August 1860 in the household of Joseph Bennett Day and Francis Deborah Lambert at Franklin Township, Clermont, Ohio, USA. Marcellus Augustus Wood appeared on the census of 27 June 1870 in the household of Mary Day at Washington Township, Clermont, Ohio, USA.5 Marcellus Augustus Wood was Teacher, Tax Assessor of Washington Twp. for five years, Recorder of Clermont County, elected in 1874 and 1877. In the Federal Census of 1880 for Union Twp. Clermont Co., OH, he is listed as County Recorder. [S112] Publication sponored by Clermont County Genealogical Society, Clermont County, Ohio Marriage 1850-1874. [S29] Clermont Co. Genealogical Society, History of Clermont Co, pages 280-281. 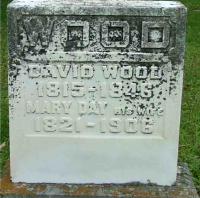 He David Wood, Sr. was the youngest of four sons of John Wood, Sr., who died in Derry Township, Mifflin County, PA, shortly before March 8, 1799, and his wife (name unknown), who was living at that time and probably after the probate of her late husband's estate in 1803. Although David's birthplace in 1764 is unknown, his son Joseph Wood's obituary in the Clermont Sun of November 7, 1877 states that his father was "raised in Pennsylvania." This tallies with the record of the Order of Survey #5012 granted to John Wood on 31 May 1768 for 80 acres in Derry Township then in Cumberland County, PA, later Mifflin County, PA. Nothing is known of David's life until his Revolutionary War service in the 7th Virginia Regiment. After the War he appears to have settled for a time in Frederick County, where he met and married LOUISA SMITH/SCHMIDT on February 15, 1793. David Wood, Sr., his wife Louisa, and at least two children, Elizabeth and Mary Wood, joined the Wood-Manning migratory group in Mason County, KY ca. 1795-6, where he is of record in the tax list of 1796 with 1 male aged over 21 years, 3 horses and 5 cows. The interrelated group consisted basically of the married sons and daughters of two Pennsylvania settlers of the middle 1700's, John Wood, Sr. of Beaver and Penn's Townships, Northumberland County and Derry Township in Cumberland County, later Mifflin County, Pennsylvania, and his friend and sometime neighbor, Nathan or Nathaniel Manning of Beaver and Penn's Townships, Northumberland County, Pennsylvania with wife Jane. Nathan Manning outlived his friend, John Wood, Sr. by nine years and lived to see his large family settled in Clermont County, OH, where he died August, 1808. Among the group of settlers were John Wood, Jr and wife Margaret, Jeriah and Mary (Manning) Wood, John and Elizabeth (Wood) Manning, Joshua and Martha (Wood) Manning, and bachelor Nathan Manning, Jr.
John Wood, Jr had been the first known of the family to settle in Mason County, KY ca. 1792/3, where he was of record on tax lists from 1793-97. The John and Joshua Manning families of record in Mason County in the 1795-1797 tax lists had joined John Wood, Jr. in Mason County ca. 1794/5. The Jeriah Wood family appears on the Mason County tax lists of 1796 and 1797. The Wood and Manning family group crossed the Ohio River and established a fortified "station" or stockaded settlement similar to those along the frontier in Kentucky in the Virginia Military District near Big Indian Creek on land actually owned by Thomas Buckner (Survey #1087) in the southern area of the Northwest Territory, later Clermont County, Ohio. There they built rough log cabins enclosed by a fortified stockade. The settlement called "Wood and Manning's Station" was near a free flowing spring still visible today west of Collier Road in Washington Township, a mile east of Calvary Methodist Church on Route 756. Va Continental Line; Moved to Ky 1791, thence to Washington Twp. clermont co, 0, 1795; he and two brothers erected a heavy stockade, "Woods and Manning Station" near calvary M.E. church, Daniel Boone and Simon Kenton often stopped there. Br. 1764, Va. Children: John S, (mar. Eliz. cameron), Geroge, (mar. Sarah Fee), Joseph, (mar. Margaret Bennett), Absolom, (mar. Phoebe McGohan), David, (mar. Mary Day), Bazil C, Alfred, dau. mar. Wm. Barkley, dau. mar. Robert Badgley, dau. mar. Joseph Dole, dau. mar. Jos. Buchanan. D. 1848. Ref: A.S. Abbott, Bethel, O. Fur. infor. Cincinnati, Ohio. It has been stated that this David Wood enlisted and served in Revolutionary War 2 years in Capt. Matthew Jouett's Co., 7th Virginia Regiment commanded by Col. Alexander McClenachan. The DAR Lineage Book Vol 58 shows: "David Wood (1737-1813 served 1777, as a private in Capt. Matthew Jouett's company, Col. Alexander McClenachan's 7th Virginia regiment. He was born in Louisa County; died in Albemarle County, VA." A search of this regiment's muster rolls shows onethis one was enlisted for the period of 28 Dec. 1776 to 21 May 1777. This name continues to be seen until August 1777. 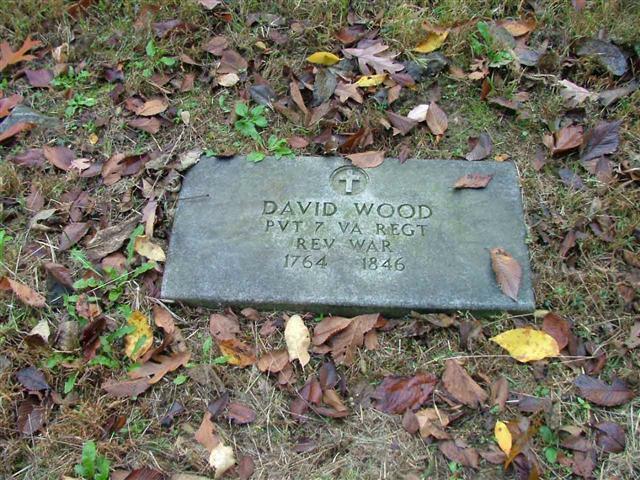 The name David Wood does not appear again until November 1777 in the same regiment. When it does show up, the term of enlistment is until 10 April 1778. In Dewc 1777 David Wood is shown with his enlistment terminating in 1778. In the Feb 1778 muster, David Wood is shown with a 2 year enlistment. This is the last time David Wood is mentioned in this regiment's muster rolls. From this it is possible that there were two David Wood serving at two different times but it would require additional documents to determine if the David Wood who died Clermont Co. Ohio was one of them. [S956] Marriage Record from Virginia Marriages 1660-1800. [S464] Clare McVickar Ward, "Jack Wood Report by Clare Ward", Ancestral File, This source reports his death on 11 Oct 1846, not Dec. Indicated source of location was Patricia R. Donaldson sketch map of David Wood Cemetery and house and barn. Sept. 1977. [S28] DAR - Beech Forest Chapter, DAR Clermont Co Cem Mon Vol 10, "David Wood, Rev. Soldier, is buried in this cemetery with only a creek stone for a marker-- so says Mrs. Laura Trout, a descendant nearing 90 years of age." Find A Grave Memorial# 16302858. [S41] DAR, DAR Rev Soldiers Bur in OH, Page 407. [S690] "Headstone Application for Veterans, WOOD, David." She was a witness David Wood, Sr. was the youngest of four sons of John Wood, Sr., who died in Derry Township, Mifflin County, PA, shortly before March 8, 1799, and his wife (name unknown), who was living at that time and probably after the probate of her late husband's estate in 1803. Although David's birthplace in 1764 is unknown, his son Joseph Wood's obituary in the Clermont Sun of November 7, 1877 states that his father was "raised in Pennsylvania." This tallies with the record of the Order of Survey #5012 granted to John Wood on 31 May 1768 for 80 acres in Derry Township then in Cumberland County, PA, later Mifflin County, PA. Nothing is known of David's life until his Revolutionary War service in the 7th Virginia Regiment. After the War he appears to have settled for a time in Frederick County, where he met and married LOUISA SMITH/SCHMIDT on February 15, 1793. [S42] Phyllis Manning Gillaspie, "Phyllis M. Gillaspie", Ancestral File, Sheet for David Wood. Find A Grave Memorial# 76138437. [S464] Clare McVickar Ward, "Jack Wood Report by Clare Ward", Ancestral File, Louisa was the daughter of perhaps John or John Frederick Smith/Schmidt and his wife Elizabeth Smith, who died June 7, 1822, aged 91 years probably in David Wood's home in Washington Township, Clermont County, OH. Find A Grave Memorial# 76086145. He was a witness David Wood, Sr. was the youngest of four sons of John Wood, Sr., who died in Derry Township, Mifflin County, PA, shortly before March 8, 1799, and his wife (name unknown), who was living at that time and probably after the probate of her late husband's estate in 1803. Although David's birthplace in 1764 is unknown, his son Joseph Wood's obituary in the Clermont Sun of November 7, 1877 states that his father was "raised in Pennsylvania." This tallies with the record of the Order of Survey #5012 granted to John Wood on 31 May 1768 for 80 acres in Derry Township then in Cumberland County, PA, later Mifflin County, PA. Nothing is known of David's life until his Revolutionary War service in the 7th Virginia Regiment. After the War he appears to have settled for a time in Frederick County, where he met and married LOUISA SMITH/SCHMIDT on February 15, 1793. We can judge from his varied Inventory of March 26, 1799 just how self-sufficient his household was in the production of not only food and shelter, but in hide tanning for boots and shoes, harness, saddles, and straps, as well as in linen and woolen cloth-making: starting with flax seed and sheep on the hoof and proceeding through every process to the looming of home spun fabrics. Bee hives for honey. Cows for milk and butter. Oxen for plowing. Barrels for sweet cider. Meat tubs for sausage making. Pots for pickling. A clue to a less primitive frontier heritage may be seen in the Delft china plate and the tole ware dish sold at the estate sale (Vendue) and also by the "assortment of books," which were not put into the sale by the Executors! Very possibly Executor John Wood, Jr., a future Associate Justice of the Clermont County (OH) Court of Common Pleas, kept his father's treasured books. [S42] Phyllis Manning Gillaspie, "Phyllis M. Gillaspie", Ancestral File, Sheet for John Wood, Sr.
[S689] 1790 Federal Census, unknown repository address. [S432] John Wood Sr's Will unknown file number. John Wood appeared on the census of 1790 at Northumberland, Pennsylvania, USA.3 He About the same time (fall of 1795) John, David, and Jeriah Wood and Elisha and John Manning, brothers-in-law of the former (the Woods), with their families, came from Kentucky, and after some difficulty succeeded in reaching a fine spring about a mile from the cabin of William Buchanan, where they determined to locate temporarily. After the pioneer manner in Kentucky, they erected a stockade of heavy timber around their buildings and a small clearing for protection against possible attack by the Indians, who had not yet entirely left the country. This was known to the settlers as Mannings' Station and later, from the owner, as Miller's Station. The station was never attacked, but it gave the occupants and the people in that part of the county a sense of security which they could not have felt without its existence. It is related that the station was a general resort for the incoming settlers, and that Simon Kenton and Daniel Boone sometimes sojourned there. On many occasions William Buchanan would take his family and cattle to the stockade and abide there until the presence of Indians was no longer reported by the scouts. For the first few years the Woods and Mannings occupied themselves in clearing up the land around the station, and some time before 1800 were rewarded for their labors by Nathaniel Massey, the agent of the owner of the Buckner survey, who gave them title-bonds for lands in neighboring surveys, on which they afterwards made their homes. The station and the surrounding improvements became the property of Martin Miller, and the timbers used in the construction of the stockade walls were early removed and used for other purposes. John Wood, the eldest of three brothers that came to Mannings Station, was one of the early associate judges and while attending court at Williamsburgh fell ill, dying the next day after he was brought to his home north of Neville. He had five sons and two daughters, Joseph, who married Mary Hodge and died in Tate sixty years ago; Absalom, the husband of the widow Buchannan, William removed to Illinois, as did also John and David; one of the daughters married David Jones, and the other Peter Collins, of Highland County. [S434] Browning, "Email Kim Browning 020711", Ancestral File. [S42] Phyllis Manning Gillaspie, "Phyllis M. Gillaspie", Ancestral File, lists census reference. with David Wood Sr.3 Her married name was Manning.1 Martha Wood FamilySearch ID # Family Search ID K19D-JBT. [S28] DAR - Beech Forest Chapter, DAR Clermont Co Cem Mon Vol 10. Service Record: Enlisted in Company D, Indiana 16th Infantry Regiment on 17 Aug 1862.Mustered out on 18 Mar 1863. Original data: National Park Service, Civil War Soldiers and Sailors System, online , acquired 2007. There is confusion concerning two individuals: Bazel (Bazzel or Bazeal) G. Wood and Brazil (Brazilla) Wood. Herein lies the confusion, The History of Clermont Co. [Ohio] 1888, Page 363 stated: "David Wood [Sr.], the second of the brothers [sons of John Wood Sr.], died on the Smith survey, at the age of eighty-four years. His children were . . . Bazel G. died at Vicksburg, Miss. . . ."
* The report in The History of Clermont Co. [Ohio] 1888 is incorrect. * These are two completely separate individuals. * David and Louisa Wood of Clermont Co. Ohio never had a son by this or similar name. 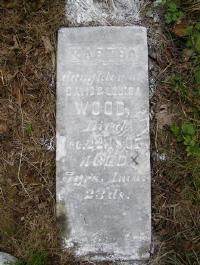 * There was a Basil G. Wood in Clermont Co. who may have been born in 1817 and may have died in 1843 in Vicksburg, Miss. * I do not believe there is a close link between Brazil Wood and my Wood family from Pennsylvania as his Wood line originated in North Carolina. My reasoning is outlined below. If we believe the History of Clermont Co., 1888, [Ohio] David Wood Sr.'s wife, Louisa Smith Wood, would have to have been 76 years old when Bazel was born or 63 when Brazil was born. The Basil born possibly born in 1817 is a possible son, however I found no record of David Wood Sr. having a child with this or a similar name, or of them living in Indiana. 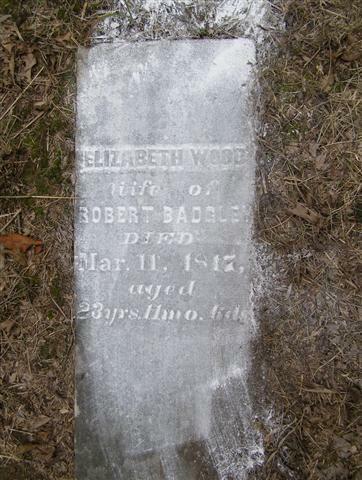 BAZEL G. WOOD was born in Clermont Co. Ohio around 1849 according to 1850 and 1860 US Census reports. He is shown living with Joseph and Margaret (Bennett) Wood and NOT David and Louisa Wood. This would imply that he is Joseph's and Margaret's son (but the Census reports for those years do not list relationships). The spelling of his name varies slightly but was always spelled starting with "Ba" and never "Bra". Bazel married Lydia McGohan in 1878. They had three sons (who all died young). He died and was buried in Clermont Co. Ohio in 1904. I found no mention of Civil War service or a link to Indiana. Another BASIL G. WOOD is mentioned in the 30 March 1838 Clermont Courier newspaper as having a letter at the Bethel Post Office. There is also a mention in the same newspaper on 19 Aug. 1843 page 63 "At Vicksburg, Miss., on the 21st July, Mr. Basil G. Wood, formerly of this county, in the 26th of his age." BRAZIL (BRAZILLA) WOOD was born in Indiana around 1833 according to the 1860 US Census. At the time of that Census he was married to Mary Ann Stotts and they had two children. I believe that his father was Robert Wood who moved from North Carolina to Indiana. Robert had married Tabitha Field in 1809. In 1835 when Brazil was around 2, his mother died and his father married Abigail Coleman a short time later. Then his father Robert died of typhoid fever in 1849 leaving Abigail with a number of young children. Again, the spelling of his given name changes slightly but is always spelled starting in "Bra" and never "Ba". In the 1860 US Census, Abigail and Brazilla are found living next to each other reinforcing the relationship that she was his stepmother. 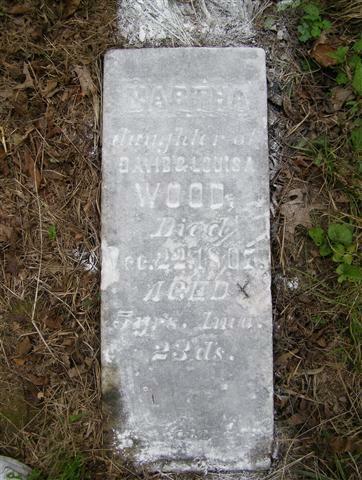 In 1862 Brazilla G Wood enlisted in the Union Army and then dies in 1863 near Vicksburg MS during the Civil War. Pension papers were filled for his wife Mary and son Robert H. to collect a pension for Brazil's service. While I do not currently have copies of them, I found nothing linking Brazil to Clermont Co. Ohio. However, I do not have firm proof of Brazil Wood's parents or his location prior to 1860. If anyone has additional information on this, please contact me. [S802] Adjutant General of Indiana, Rosters of Enlisted Men of Indiana 1861-1863.